If there’s any industry whose content should inspire trust, it’s that of the investment and wealth management industry. They’re asking consumers to entrust their nest eggs with them. And there are lots of eggs. PwC forecast that the mass affluent segment alone would put up to $10 trillion under management by 2020. 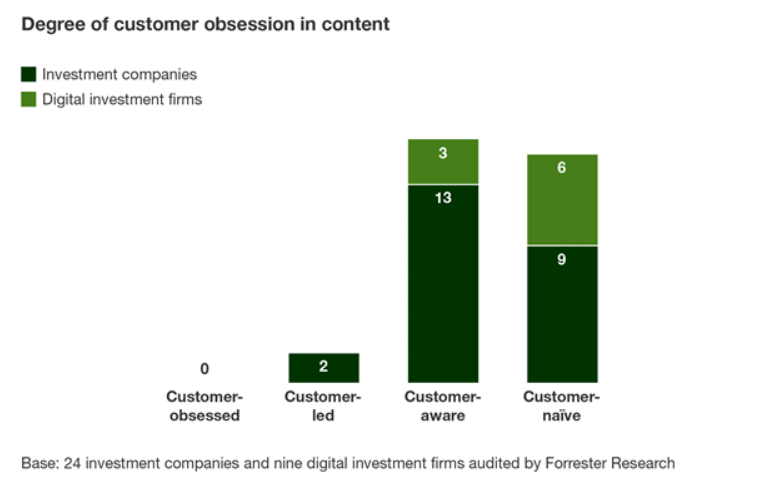 The vast majority of investment companies failed to demonstrate a commitment to their customers through their content. They talked (a lot) about how committed they were to their customers. Examples like Wells Fargo’s recent scandals tell customers a different story. Customers simply don’t believe these companies. It’s down to this industry to demonstrate customer obsession.